p.s. they’re all under $50!! Win for you and me! The second pick I have chosen is from Zara. I love shopping Zara for pieces that are on trend and relatively inexpensive. That is huge to me when it comes to adding pieces to my wardrobe. My philosophy is to spend money on the items that are wardrobe staples and save money on the items that will be around for a season or two. 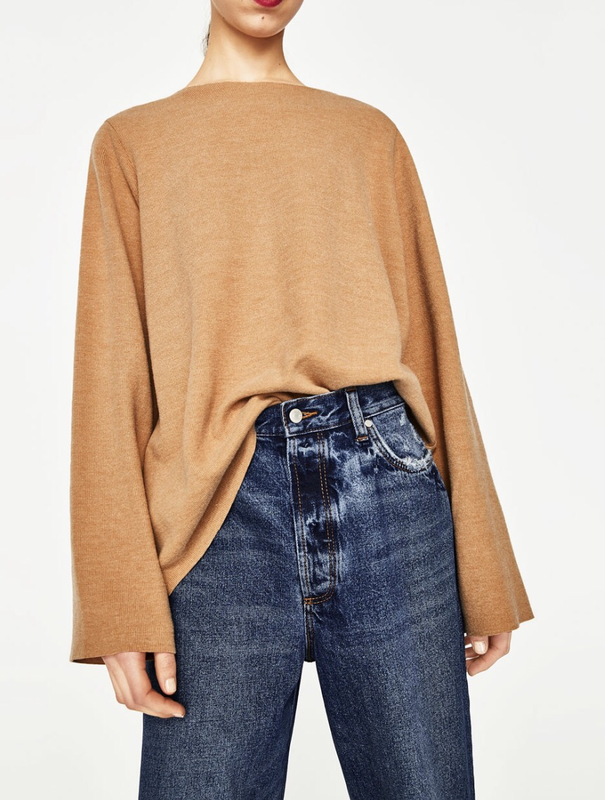 This Zara Bell Sleeve Sweater is a great option. I really love this sweater. The lines on it are fantastic. It has a polished and expensive feel to it. It is an awesome price point at $22.90. I picked the beige color for this blog post, but it also comes in three additional colors: grey, dark grey, and pink. 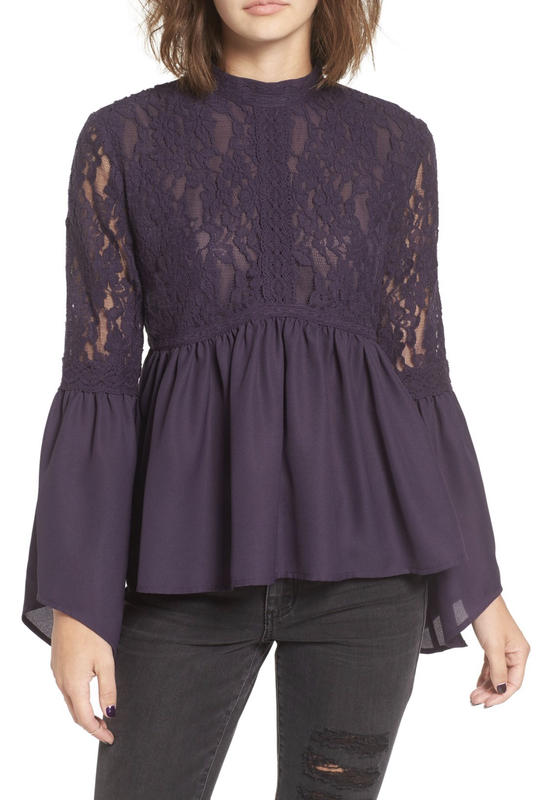 My third pick is this romantic eggplant lace colored top by Sun & Shadow. You can definitely take this top from day to night. The lace detail, the peplum hem, the keyhole on the back….in love! The color isn’t something that I am normally drawn to, but I feel it was the right choice for this design. 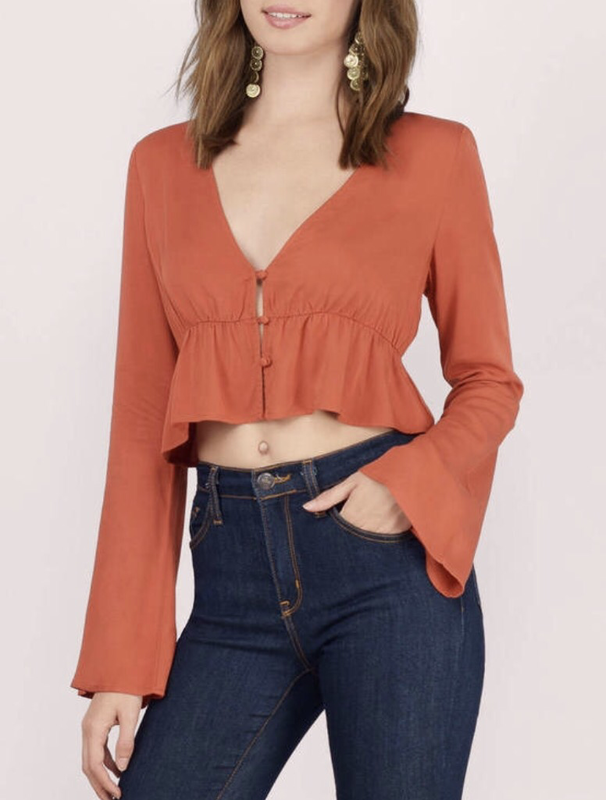 I found this top on sale at Nordstrom ($34.50). If you are interested in this top, I would act fast – sizes are going quickly. My final choice is a little unexpected for me. I must admit, I usually stray away from cropped tops and blouses. I always feel a little self conscious. So this pick is for all of you ladies that love the cropped look. This top is from Tobi ($46). I really love the rust color and the ruffle hem. It also comes in a very nice ivory color option as well. Don’t worry! I would never leave you without a complete look. 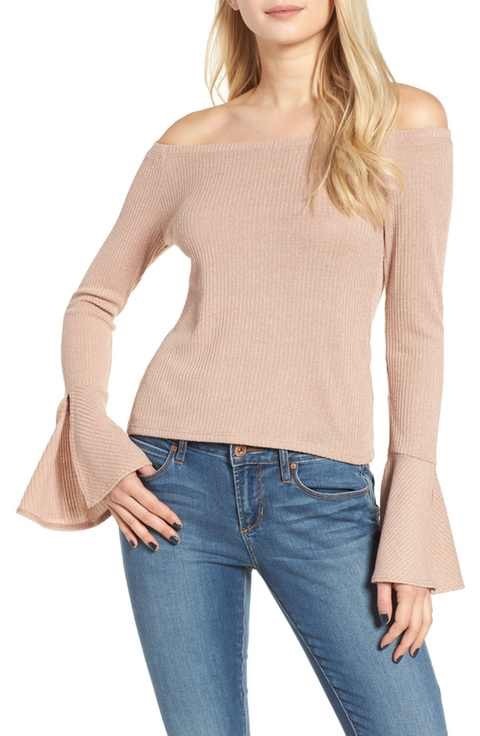 I have picked out the perfect jean and shoe that I would pair with all four of these bell sleeve tops. The jeans are from J Brand. J Brand is my go to jean. I love the way they fit and they are extremely comfortable. I highly recommend that you try some on the next time you are out shopping if you haven’t yet. I have chosen their style: 811 mid-rise skinny with step-hem in mesmeric ($198). Their skinny jeans have the perfect amount of stretch in them. I love the step-hem on this pair of skinnies. It is a great detail. **If you are a first time shopper on their site they offer a 15% discount for your online purchase. The shoe I have paired with these looks is the Sam Edelman – Telsa d’Orsay Pointy Toe Pump ($119.95). 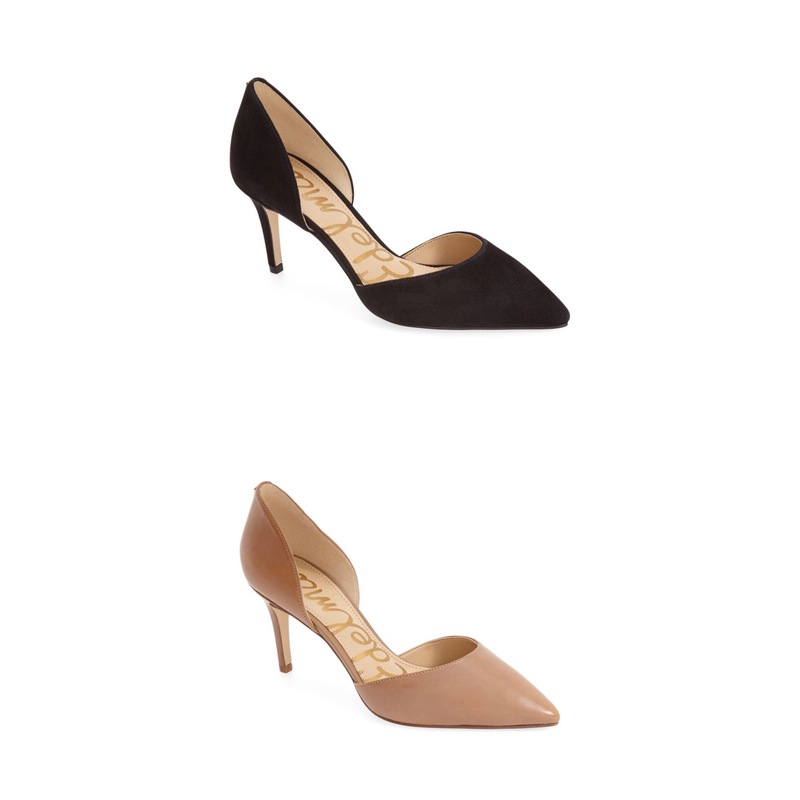 I think the black suede or golden caramel are both excellent choices. Either of them would work well with the color options of the tops I have chosen for this blog. Please feel free to reach out to me with any questions, opinions, or comments! I welcome the feedback. Until next time! ← What’s in her bag?